29 years, 10 months, 10 days old age. David Miller will turn 30 on 10 June, 2019. Only 1 months, 20 days, 22 hours, 8 minutes has left for his next birthday. David Miller has celebrated the total number of 29 birthdays till date. See the analysis by days count and bar graph. 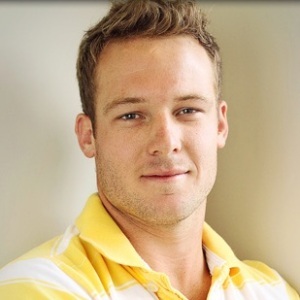 David Miller was born on 10-06-1989 in Pietermaritzburg, KwaZulu-Natal, South Africa. He is a South African Cricket Player. David Miller, South African right-arm off spin bowler and left-handed batsman. He is former captain of Kings XI Punjab in IPL. He also represents South Africa in both Twenty20 internationals and One Day Internationals. He completed his graduation degree from Maritzburg College, Pietermaritzburg. He scored a half-century in his first innings in Dolphin’s final game of 2007-2008. His side finished as a finalist for the Dolphins Pro20 series Twenty20 Competition. In 2013 he was sold to Kings XI Punjab. The very same season, he scored 101 runs in 36 balls against Royal Challengers Banglore at Mohali. After losing IPL six times, he was replaced by Murali Vijay as the captain. In IPL 2015 a policeman was hit by his ball on his left eye after being hit 6 by David. In 2015 World Cup, he was one of the best performers and scored 324 runs at an average of 65. He has many international centuries against West Indies, Zimbabwe, Australia, and Sri Lanka. He got many men of the matches award against Sri Lanka, Zimbabwe, and Australia. On 25th January 2015, against West Indies, he made his One Day International Century in 4th ODI. David Miller has a sporting family. His father was a club-level cricketer, he wanted David to play hockey, squash, cricket, and tennis. He is known for his aggressive batting and his inspiration is Matthew Hayden. He loves to play against India and Australia. Miller was also appointed the Kings XI Punjab's captain despite his limited experience in that role. He led Kwa-Zulu Natal in the Africa Cup T20. His stint as captaincy didn't work and was eventually removed. The Kings XI Punjab management though showed faith in him and retained him at the IPL Player auction 2018 at INR 3 Crores. He was born to Andrew Miller. Matthew Hayden was his inspiration and he picked up cricket bat only after inspiring from him. He is called ‘Pups’ by his teammates. During his childhood, his aim was to become a Rugby player. His father Andrew Miller was a club-level cricketer. To keep himself fit, he plays multiple sports.